It is not easy for one to think of all the applications that the hydraulic systems can be found in, since they cover a large proportion of the circle of operations that take place in a market. BIOFIAL HYDRAULICS since its establishment in 1973 has been actively involved in supporting each field of industry, any application that requires the use of cylinders and every project that operates with hydraulics, thus offering complete solutions. Being an experienced hydraulic manufacturer for more than 42 years now, BIOFIAL HYDRAULICS has always tried to expand its field of expertise to applications and installations that can be applied in a wide variety of projects. 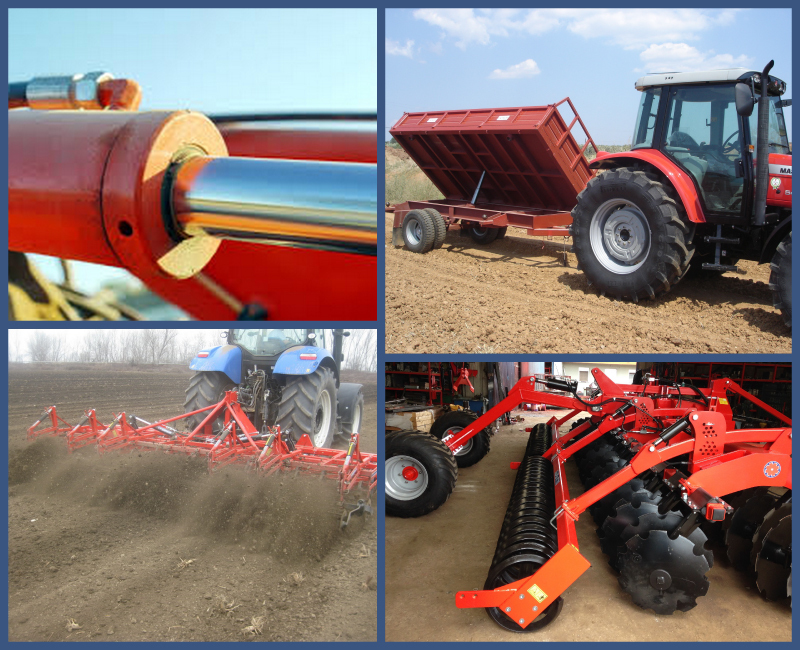 Our main focus in the past decade has been the hydraulic lift system industry, but the company has originally started its production with primarily agricultural applications. Over time it expanded into the production of cylinders and hydraulic systems literally for every industrial application. Being able to calculate, design, plan, develop and produce any kind of hydraulic cylinder and hydraulic power unit, no matter the length, the capacity or the eccentricity of each project, is one of the key advantages of the company. The flexible production of BIOFIAL HYDRAULICS is able to support any demand under the specifications provided for each customized project, either with sole hydraulic products (cylinders, power units, metal frames, etc) or with complete hydraulic solutions, ready to be installed and operate. BIOFIAL HYDRAULICS distinguishes itself with a competitive combination of premium quality production process, precision, experience and flexibility. Our worldwide clients value us highly for this unique mix and thus we are honored to apply our expertise for over 42 years in every possible hydraulic operated project. So, we would like to present to you some of the main sectors that our products are been applied, but also some of the most unexpected applications that we strongly support and that it is highly possible to find a custom made BIOFIAL HYDRAULICS product, cylinder or power unit. The lift industry includes many different options and systems that can be installed in a building. Its two main segments is the industrial and the commercial one. The industrial applications include the compact cargo platforms, the hydraulic car platforms and the scissor lift platforms. The commercial ones include the passenger elevators of buildings, the disabled lifts for wheelchairs and people with walking difficulties and the platforms lifts for the use of people and cargo together. BIOFIAL HYDRAULICS can offer complete solutions for all the above and for every other possible hydraulic application. One of the main fields that hydraulic cylinders are being used is the construction industry. Customized cylinders are operating in many worksites from the tipping trucks to the mobile concrete mixers. 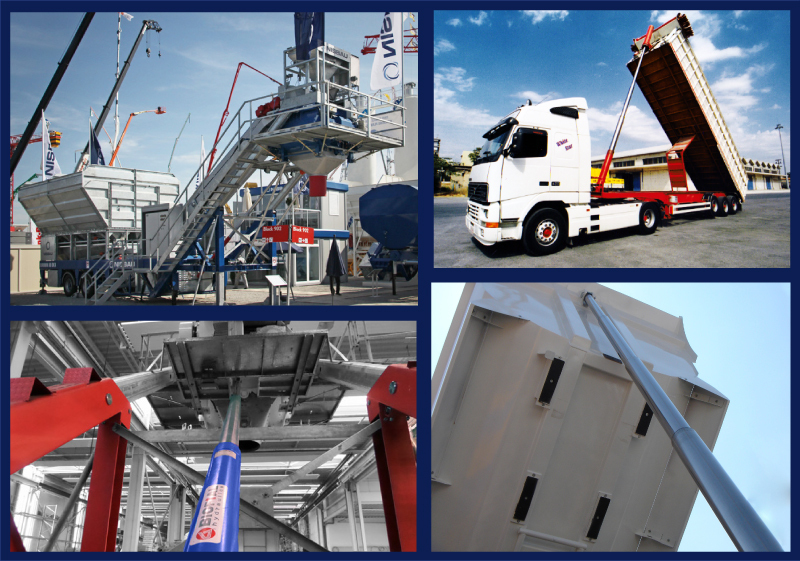 BIOFIAL HYDRAULICS is the largest company in Greece that manufactures such cylinders that can withstand in such heavy duty applications and support the modern construction site requirements. Apart from the construction projects, hydraulic cylinders are also being used in various infrastructure applications. One of which is shown below, as we were asked to construct as set of cylinders that would be operating in a lake dam. The cylinders were being used in the cleaning of filters for a pump station, in order to rejuvenate a dried lake. This project required meticulous research, planning, development and implementation due to the location of its installation. Also, BIOFIAL HYDRAULICS has manufactured cylinders that have been used in drilling rigs for water pumping in places that faced drought. The military filed also has been using hydraulic cylinders and power units in order to construct army and defense applications. An example can be seen below: the Patriot missiles are placed in a hydraulic platform that adjusts its incline in order to lock the target by the use of a set of hydraulic cylinders that are operated by the controller. BIOFIAL HYDRAULICS has provided the army industry with such cylinders that have been operating in several missions throughout the world, since 1990. One of the leading green energy fields that has grown drastically in the last decade, has been without a doubt the photovoltaic systems. In some applications were the optimal result must be achieved, the PV panels are placed above constructions that follow the sun radiance throughout the day. The hydraulic set (cylinder and power unit, with or without inverter) in this occasion moves the construction to the required place in order for the PV panels to catch the sunlight with minimum loses. 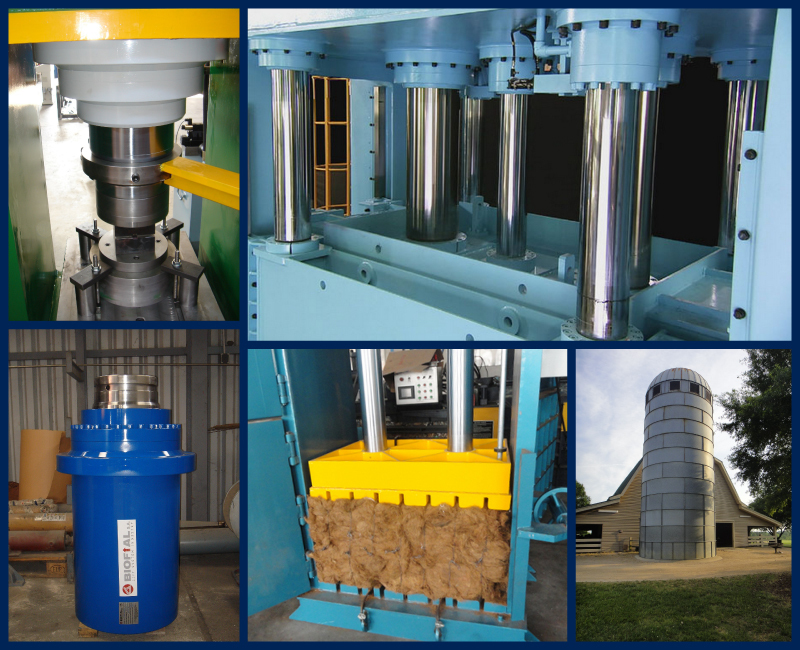 This industry might be related to the agricultural applications or to food processing field, but it remains separated due to the fact that the hydraulic products (cylinders and power units) used in this kind of projects are custom made and specialized due to their length, their capacity and their design, so they are very distinctive. Their most common uses are for the compression of tobacco or cotton, after their sorting and they are placed in tall tower buildings as seen below. Also, other industrial applications of machinery are the packing machines, the paper presses, the meat pressing machines for the food industry, the aluminum extrusion presses, plastic injection presses, etc. All the above applications are based on the strong and confidential partnership we share with our clients, in order to develop accurate customized solutions for every manufacturing and production inquiry we receive from our industrial customers. One not so common use for the hydraulic cylinders is in the shipping industry, and specifically in the split barges which are ships used to transfer heavy loads. Those ships instead of having a door in the hull’s bottom as most ships do, they split in two. The hull of the whole barge splits longitudinally between the end bulkheads, both parts of the vessel are hinged at the deck and operated by hydraulic cylinders. These cylinders must be able to operate under adverse conditions because in most cases they are submerged. 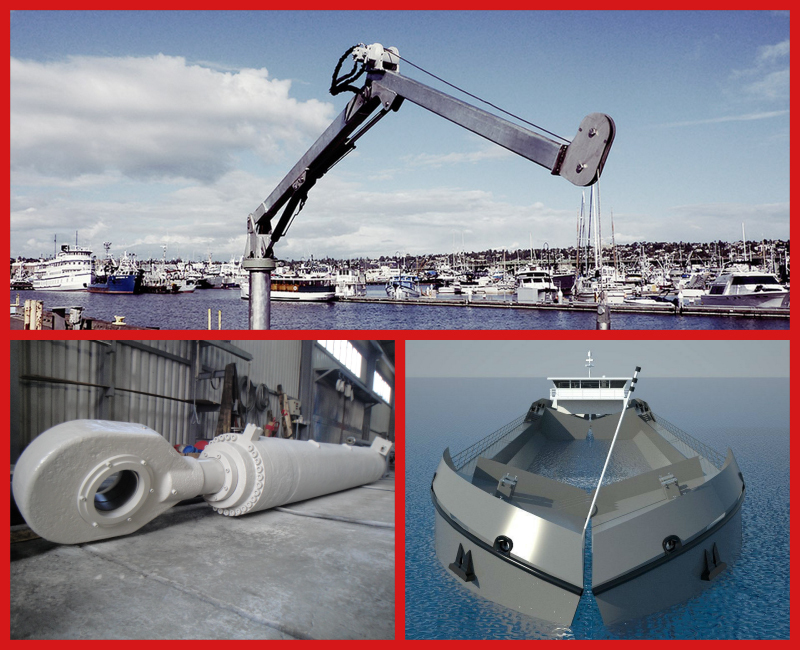 Also, marine applications can be considered the numerous hydraulic cylinders provided used for the hatch doors of ship and ferries or the service elevators installed to frigates. As we mentioned above, the agricultural industry has been the launching point for the company and its main production in the first years of operation. Nowadays the field has changed a lot, new machinery have been constructed that cover every need of the modern agriculture and off course BIOFIAL HYDRAULICS supports the industry by providing cylinders that can be implemented is such machinery. In the pictures below you can view some of the custom hydraulics that is behind such applications. 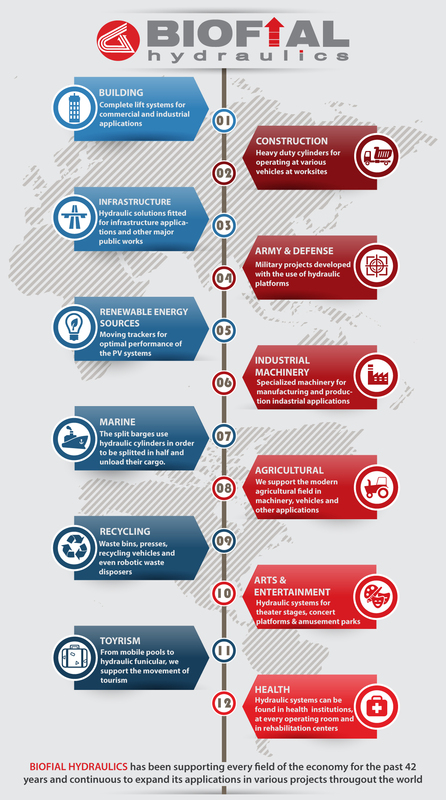 The recycling industry has been growing vastly in the past years, especially after the environmental directives that have been applied in the E.U. and globally. 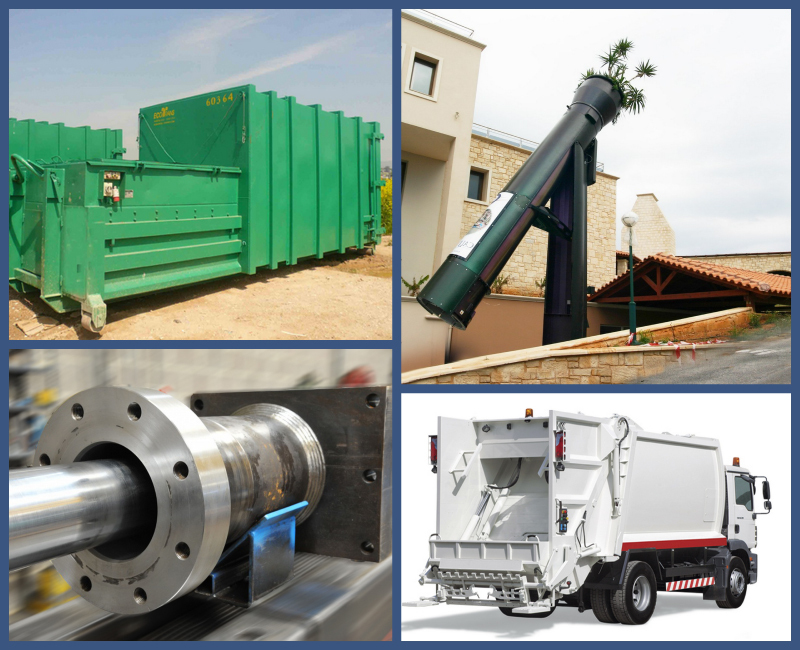 BIOFIAL HYDRAULICS has been manufacturing hydraulic cylinders that operate inside waste bins and presses to reduce the size of the collected material, as well as outside, as part of the moving vehicles. Also, robotic waste bins that can store and disinfect the garbage use are operated by hydraulic cylinders. These cylinders must be able to cope under large amounts of pressure and endure heavy loads. As seen below, these specialized constructions are of great diameter and usually of short length. Many modern display and presentation methods, from concerts to other art exhibitions require the use of hydraulic systems for showcasing the main event. Custom made constructions and platforms that can move entire stages, are being set to motion by hydraulic cylinders. 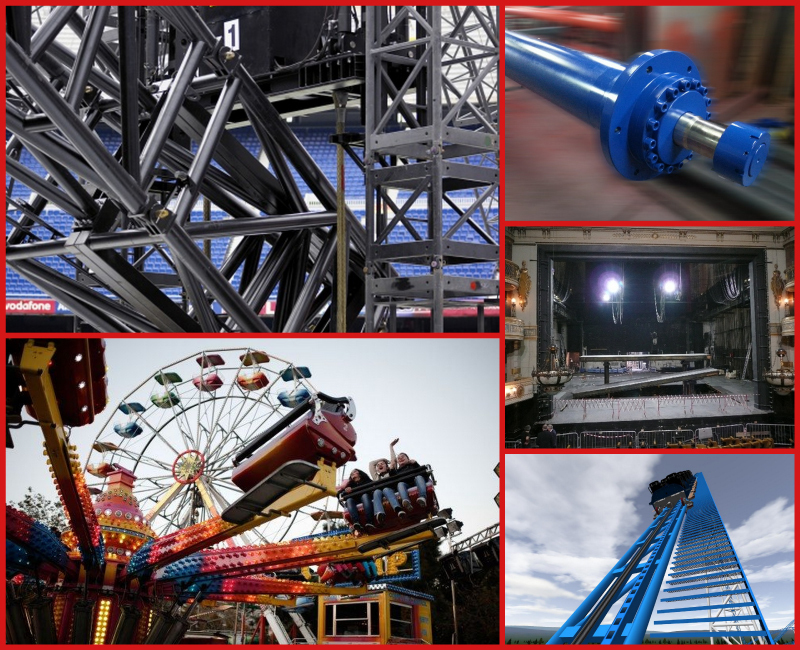 Also in all amusement parks most common rides rely in the use of specialized cylinders for their movement some of which are the rides that spin around a vertical axis, twists and roller coasters. Below you can view some examples of such applications. As tourism is one of the main developing fields in Greece, BIOFIAL HYDRAULICS has implemented several projects that promote the attractions of different establishments. 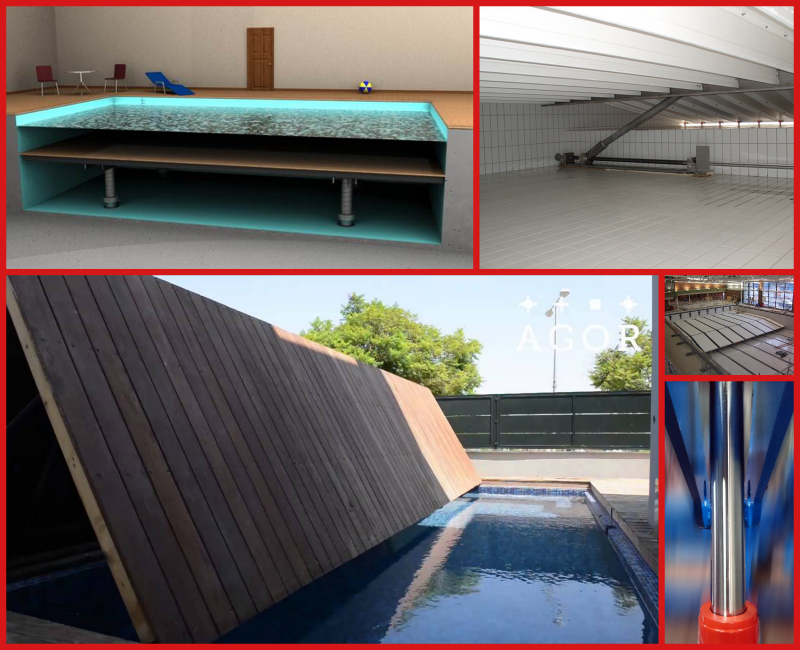 Some of which are mobile swimming pools in hotels in Greek islands, hydraulic funiculars for the transportation of people and products in Crete and off course many complete installations for hotel units in the Greek territory. 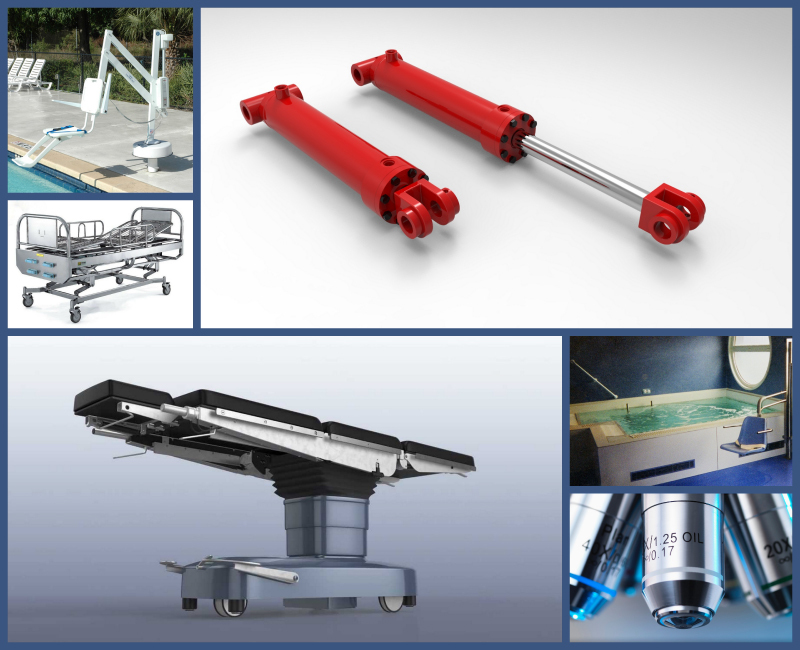 The constantly evolving field of healthcare and surgery has in many occasions included hydraulic products in many innovating new procedures, such as the use of robotic arms to perform minimum invasive surgeries, in surgical microscopes and even the movement of the operating table is based on hydraulic cylinders. Also many applications can be found in rehabilitation centers. These applications assist the motion of specialized wheelchairs that operate for example inside pools and help patients with moving difficulties to move and recover through exercise. Closing this presentation, we would like to comment that these are only some indicative applications that one can find the innovative and top quality hydraulic products that BIOFIAL HYDRAULICS has manufactured the past 42 years and keeps on manufacturing. Since the field of hydraulics is so wide and continuous to expand, the use of hydraulic products is infinite and cannot be imitated in specific applications. Thus, BIOFIAL HYDRAULICS’ project portfolio cannot be presented in all its range. Some of our foremost values as an industrial manufacturer that produces such systems, are the quality and the thorough planning process, as well as the Innovation and durability of our products. Those values allow us to construct products that are safe to use and can operate continuously for many years, offering trustable solutions for the quality-demanding hydraulic industry. Due to the innovative and thus confidential nature of the projects or the applications where our products are been applied, BIOFIAL HYDRAULICS is restricted with non-disclosure agreements, in order to protect and safeguard our customers’ Proprietary Information. Therefore we cannot share comprehensive information about our complete project portfolio. Thus, above we share a selection of project that serve as examples. 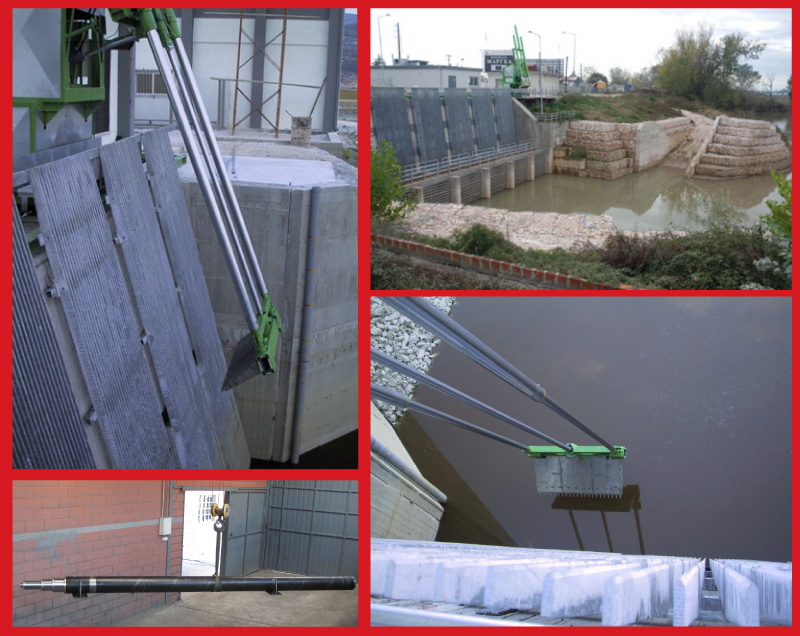 We would like to thank our respected customers and co-operators for sharing with us photos and information about the projects that have undertaken and completed with the use of BIOFIAL HYDRAULICS products and that are seen above.